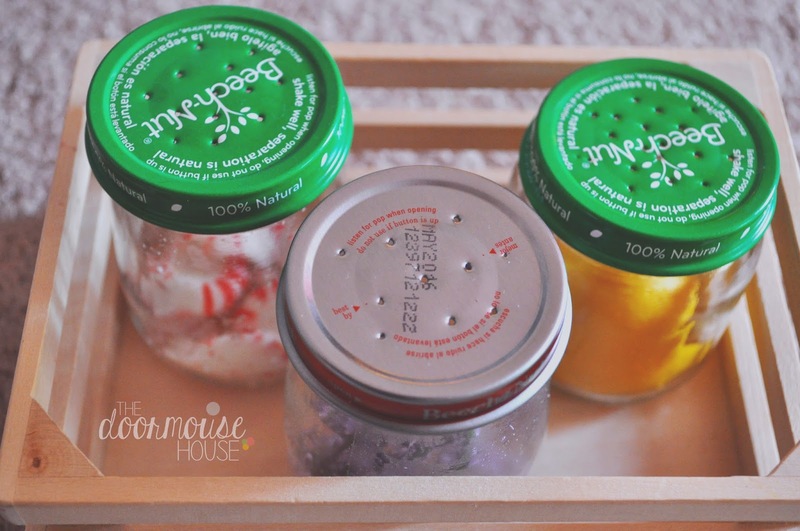 This idea comes from one of my favorite blogs for child-centered learning activities, Mama's Happy Hive, and her post about her and Little Bee's Montessori-Inspired Scent Jars! 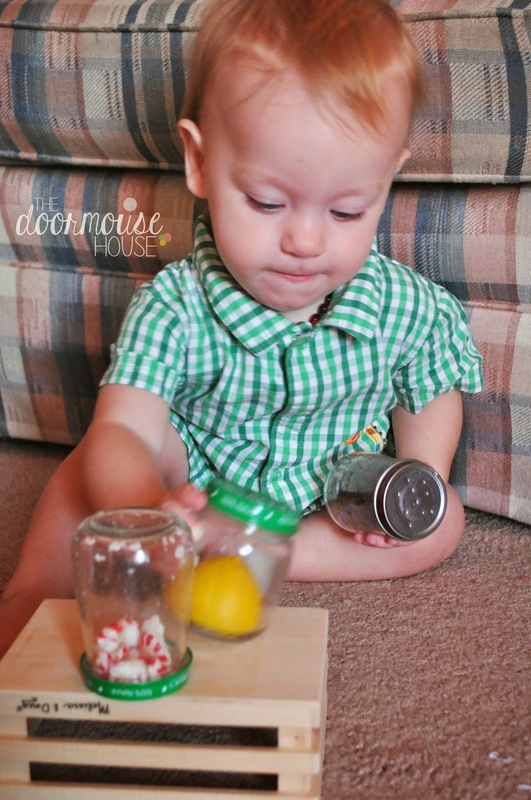 I've seen pins about Montessori Sensorial Smelling Bottles cross my Pinterest home feed every now and again, but always in the context of smelling "blind" and matching the smell either with the picture of what you think you are smelling, or with the jar of the same scent. 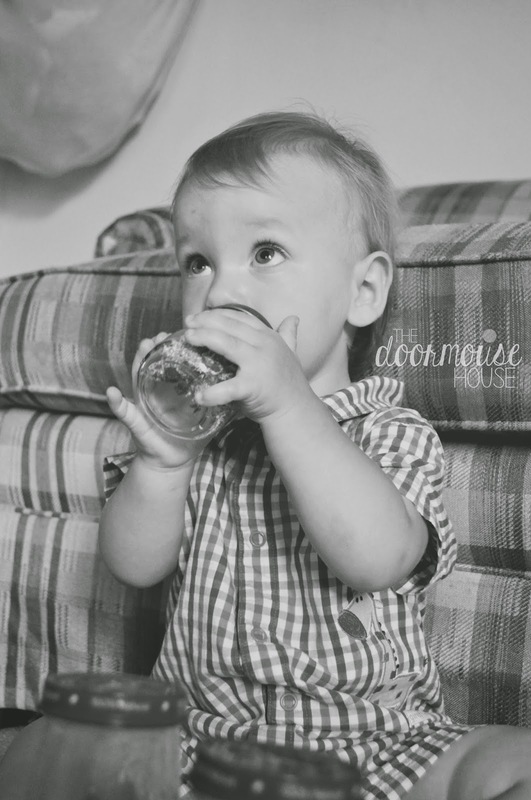 While this is great for the older crowd, it's a bit too advanced for Little Mouse's age group (14mos at the time of pictures - just a wee babe! 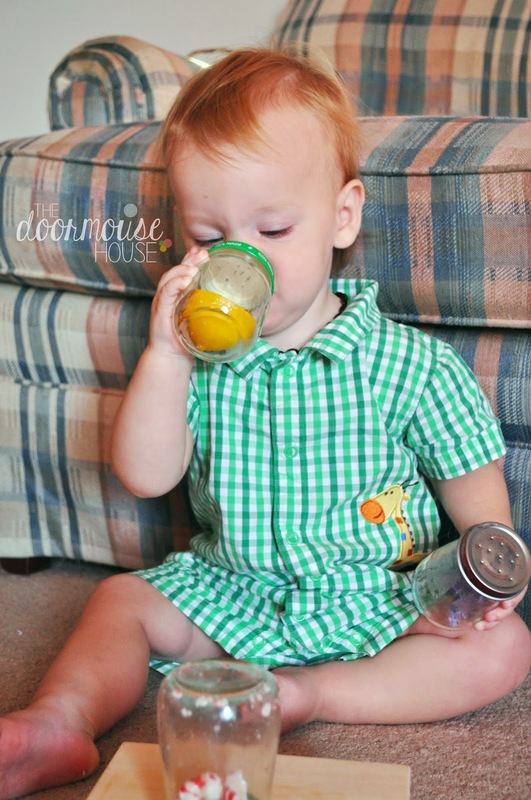 He's 21mos now...which, CAN YOU BELIEVE IT? TWENTY.ONE.MONTHS. *sob* Okay, back to the bottles...). 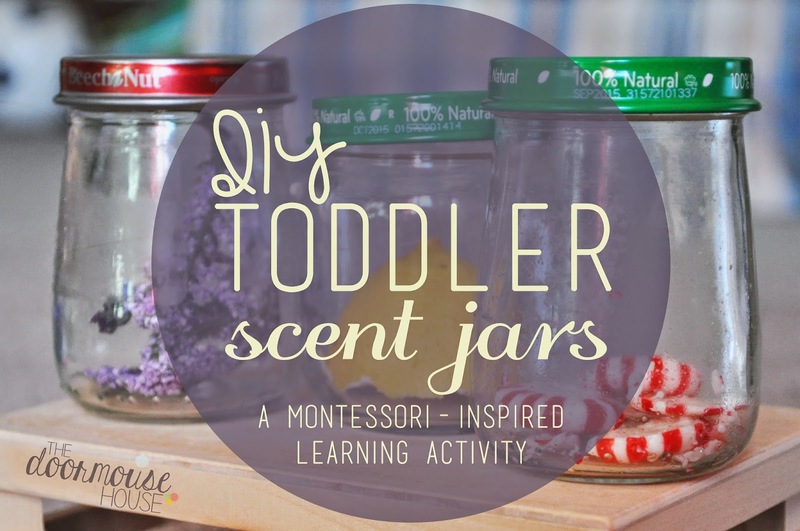 When I saw the idea for age-appropriate scent jars that help build the sense of smell and help them connect it to seeing and experiencing what they are smelling without the mess, I was so excited use my oils, a few household props, and empty baby food jars to make my own! Montessori education is, in essence, an educational approach based on the model of human development. The Montessori school of thought for wee ones, then, is that we should provide an environment scaled to the child's size and abilities, which offers opportunities to develop movement, and activities to build functional independence. 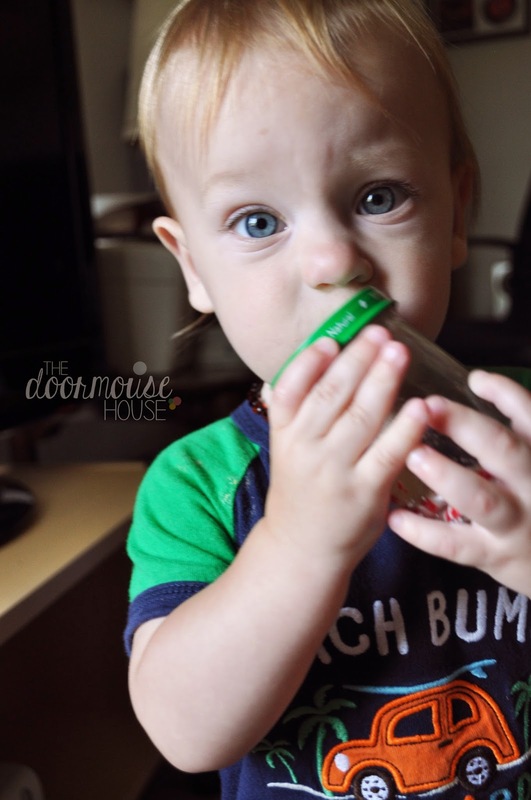 Since sensory refinement (taste, sight, touch, hearing, and smell) takes place largely from birth to about age four, this translates to a big emphasis in the early years on providing multi-sensory materials for physical exploration. Cue the fun scent jars! The scent jars are interesting to look at, with lovely bits of colorful, real-life stuff inside of familiar baby food jars (which we use for flavoring our morning oatmeal). 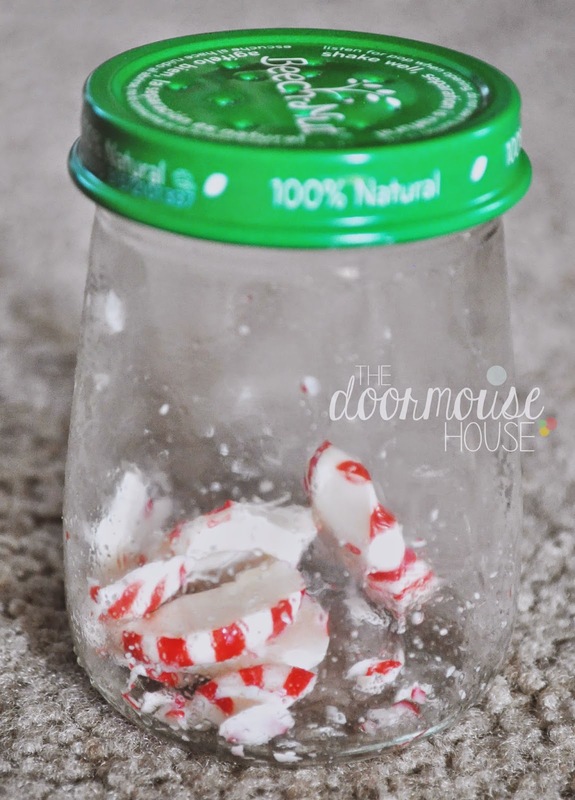 Sometimes, as in the case of the peppermint jar, they are LOUD and fun to shake until the peppermints break into little bits inside the jar! And of course, they smell lovely, and help to develop that ever-growing sense of smell, which, as Mama's Happy Hive so duly noted, facilitates memory learning! I don't know about you, but smells almost always instantly transport me back to a time (petrichor=summer going into eighth grade), a place (diesel fuel & tire rubber=Chicago), or remind me of a particular person (Stetson cologne=my Dad); our brains are so amazingly wired to connect smells to memories. So, what I did is punch a series of small holes in the lid, and for the lavender and lemon jars, put one drop of essential oil with its corresponding "prop." One jar was peppermint (with no essential oil, as that is not an age-appropriate oil), one was lemon, and one was lavender. Peppermint got the funniest faces, but was by far his favorite. That thing got shaken, carried, and sniffed all around the house! And it is SO FUNNY to see a toddler smelling something, because it's a really big production at this age, with a lot of heavy breathing in and out of the nose. Pretty cute. I am excited to "graduate" to the more advanced scent jar activities in the future, especially since we're laying the groundwork by building and fine-tuning the sense of smell with fun, easy activities now. 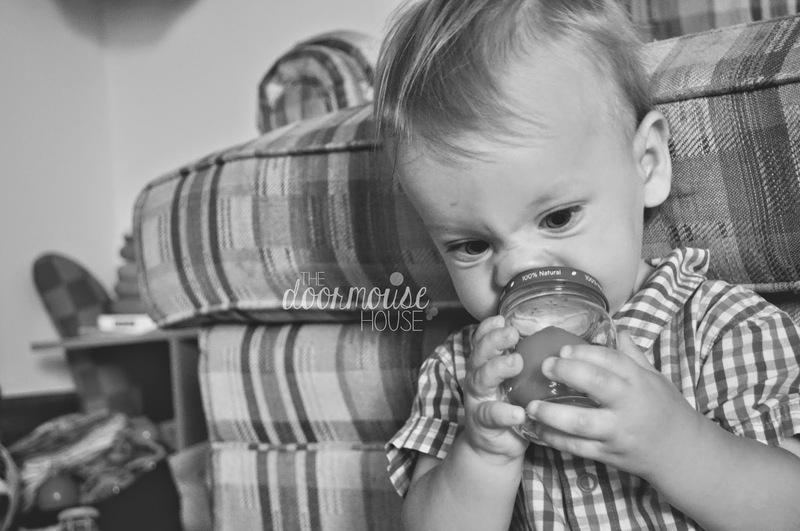 For the time being, though, I think three scent jars are more than enough for my rambunctious little toddler! 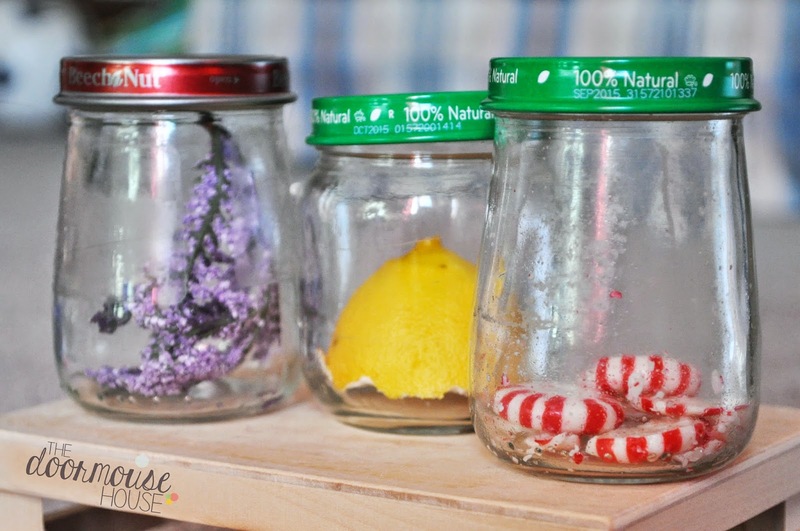 Have you ever made your own scent jars for your little ones? Do you ever do structured learning time? (or do you even have time for it? Haha that's how I feel some days!) Join the conversation in the comments below! This does change the manner in which we look as Jennifer Lopez Skin Care well as even lifts our self-assurance and include a touch of charm in our occupied and distressing lives.